Samuel Peek was born in England in c.1807 and immigrated to Sydney with his wife Caroline (née Webb, married in c.1831 in Gloucester) in November 1835 on the Richard Walker. They had no children. Samuel and Caroline Peek died in the wreck of the Dunbar on 20 August 1857. Samuel’s brother Richard also immigrated to NSW in the 1830s and the two were in business together. A Samuel Peek, possibly a nephew, died at Sydney in 1882, aged 53. Samuel Peek bought up land in Sydney, Balmain and East Gosford from the mid- to late-1830s. He was an original settler of the East Gosford township and operated a steamer between Gosford and Sydney. In May 1842, Samuel Peek was operating as a storekeeper in George Street, selling salt, butter, jams and wines, but by the following September Samuel Peek & Co, grocers of George Street, went into voluntary liquidation and were declared bankrupt in April 1843. The insolvency meant he lost control and ownership of most of his East Gosford interests and forced him to sell his Patent Slip and Stores at Queens Place in Sydney. In September 1843, S Peek & Webb were charged with fraud, having declared their retirement in October 1840 and restarted business near Peek & Campbell who had bought them out. By 1851 Samuel Peek & Co were established again as wholesale and retail grocers and wine and spirit merchants with premises at 295 Pitt Street and 424 George Street in Sydney. In April 1857 Peek sympathised with Henry Parkes’ insolvency and agreed to postpone payment of a Promissory Note. Samuel Peek had a private residence at Nicholson Street in Balmain. He and his wife travelled to England in c.1854. When they returned from their voyage, they did so on the doomed sailing ship the Dunbar. 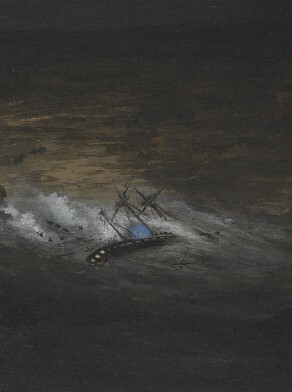 The ship was wrecked near The Gap on 20 August 1857, with only one survivor. Samuel Peek and his wife were lost in the disaster. Samuel Peek served as a Councillor from 4 November 1850 until 11 December 1851.